Those who depend on their hands for a living understand the importance of healthy wrist bones. But, some people, through no fault of their own, contract a rare and possibly disabling condition known as Kienbock’s disease. We will take a closer look at exactly what Kienbock’s disease is, the symptoms, and treatments. Kienbock’s disease occurs when the lunate bone in the wrist suffers damage due to limited blood flow. This tiny bone is one of the eight carpal bones, and is essential for movement and support of the wrist joint. As with all bones and tissue, proper functioning is dependent upon a continuous supply of oxygenated blood. Without this nourishment, osteonecrosis occurs and the bone eventually dies. Kienbock’s disease is seen more frequently in men and those between 20 and 40 years of age. It is also known as osteocronosis of the lunate and avascular necrosis of the lunate. What Are the Causes and Symptoms of Kienbock’s Disease? To date, no one cause has been identified for Kienbock’s disease. However, there are several factors experts have linked to the condition. As symptoms progressively worsen with Kienbock’s disease, most patients experience four stages of the condition. This can happen slowly over a number of years with varying degrees of advancement between individuals. This early stage can see the beginning of swelling and pain in the wrist as the blood flow decreases. This is the time when the bone has a high risk of a fracture, and the blood flow problem may only be seen with the help of a magnetic resonance imaging (MRI) scan. The pain and swelling intensify, and the wrist becomes very tender to the touch in this stage. Without the proper blood supply, the lunate bone hardens, also known as sclerosis. An X-ray will show the bone has become dense and is beginning to die as it shines a bright white hue on the imaging picture. Further testing may be done with a MRI or computed tomography (CT) scan. In this stage, the pain continues to grow, and there is a decrease in range of motion and gripping ability as weakness sets in. Here, imaging will show the bone has died and has begun to break into fragments as it collapses. This may cause neighboring bones to move their positions. Treatment usually is done to avoid this phase; however, if a patient reaches stage four, the lunate bone has collapsed. The bones and ligaments next to the lunate bone are damaged to the point that osteoarthritis sets into the entire wrist. Early detection is key for successful treatment, and to avoid the harrowing stage four of Kienbock’s disease. It should be noted that none of the treatment options guarantee the elimination of all symptoms. We have outlined the Kienbock’s disease non-surgical treatment options as well as possible surgical procedures. In order to try to alleviate the pain and swelling as well as restore blood flow to the lunate bone, resting of wrist is recommended. For several weeks or months, the wrist may be placed in a cast or fitted with a splint to prevent movement. By immobilizing the wrist, there will be less pressure and use of the lunate bone while it heals. Hot and cold compresses may be used to help with the swelling and pain. Anti-inflammatory and painkiller medication may be prescribed to treat severe symptoms. Depending on the severity and stage of the symptoms, cortisone injections may be used. To maintain range of motion, treat pain, and avoid loss of use of wrist, specific physical therapy exercises can be done. The lunate bone will need to be regularly checked for any signs of the disease progressing every four to six weeks for the first year. If Kienbock’s disease progresses to the point of surgery, there are options contingent on the stage, severity of symptoms, the patient’s age, and their dependence on wrist movement. The wrist will need to have a cast or splint for several weeks before surgery. Kienbock’s disease surgery recovery time varies among individuals and stages of the disease. The goal of revascularization surgery is to restore blood flow to the bone. Performed in either of the first two stages, this Kienbock’s disease surgery entails the removal of a portion of another bone and its blood vessels, which will then be transplanted into the lunate bone. Metal pins are attached to the lunate bone and connected to a metal fixator on the exterior of the wrist during the three to four-week healing process. Monthly X-rays are done to monitor the bone graft healing progress, with full healing expected within 16 to 24 weeks. A joint leveling procedure is done when the radius and the ulna bones of the forearm are at different lengths. There are two options to relieving the pressure on the lunate bone. A bone graft may be done to add to the shorter bone or a piece of the longer bone is removed. In the late third and fourth stages, a proximal row carpectomy procedure removes the lunate bone and the two bones on either side. This is done in cases where the lunate bone has broken into fragments and collapsed. 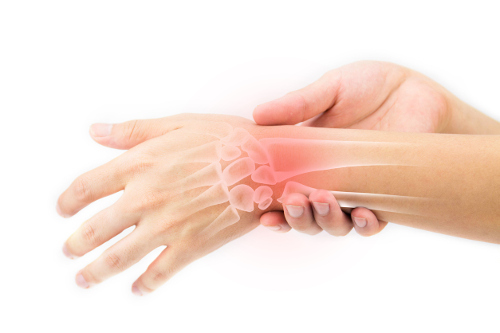 This procedure allows for partial wrist movement but prevents further complications. The latter stage of the disease may also be treated by fusing the bone with neighboring bones. A partial fusion will see a few of the bones placed together to form one bone. This limits wrist movement and alleviates pain symptoms. A full fusion has all of the bones fused together and results in loss of wrist motion. This is usually carried out in cases of severe arthritis. Both fusion procedures are permanent. Complications of Kienbock’s disease may extend beyond physical pain, as this debilitating disorder can leave sufferers feeling helpless and hopeless. We use our wrist movements for many daily tasks, so facing the decay and/or state of collapse of one wrist can be challenging for anyone. The road to recovery, if possible, can be a long and tedious one, and depression can set in for some people. It is important to follow treatment guidelines for a successful recovery, no matter how long it may seem to take. Nordqvist, C., “Kienbock’s Disease: Symptoms, Causes, and Treatment,” Medical New Today, February 19, 2017; http://www.medicalnewstoday.com/articles/264720.php, last accessed April 25, 2017. “Kienbock’s Disease,” The Hand and Wrist Institute; http://www.handandwristinstitute.com/kienbocks-wrist-disease/, last accessed April 25, 2017. Gauresh, “Kienbock’s Disease Treatment,” http://www.healthhype.com/kienbocks-disease-treatment.html, last accessed April 26, 2017. Jennings, C., “Kienbock’s Disease,” The American Academy of Orthopedic Surgeons, May 2012; http://orthoinfo.aaos.org/topic.cfm?topic=a00017, last accessed April 26, 2017.